This is the first book to introduce the impossibly unbelievable heroine Amelia Peabody. It’s around 1880 and Amelia is a 32 year old single woman who has just inherited a sizable fortune. She leaves her native England and, after a short stop in Europe where she acquires a companion by the name of Evelyn who has been ruined by an unfortunate love affair, she heads for Egypt. While waiting for their boat to be ready for a trip down the Nile, Amelia and Evelyn meet the Emerson brothers, Radcliffe and Walter, who they later encounter at Armanah where they are excavating. When the ladies join the dig a mysterious mummy frightens the local workmen away but Amelia is not so easily scared. This series is something of a guilty reading pleasure for me. I have always been a little obsessed with things Egyptian and so love the tales of the digs and discoveries that are full of fun and adventure. It’s rare for me to want to swap lives with the fictional people I read about but I’d happily switch places with Amelia if such things were possible. 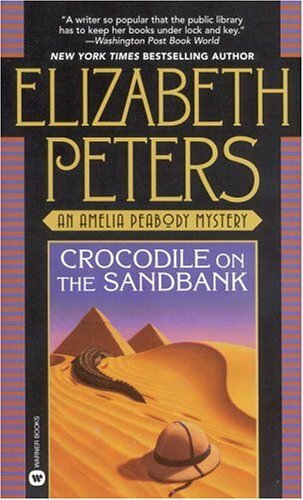 Peters clearly knows her subject as even in this first book the historical details are accurate and she takes care to depict the excavations and other events as they would have been carried out at this period (assuming that a force of nature such as Amelia had taken part any way). This book does a nice job of introducing all the characters of the series: providing some back story but leaving some things too for revelation in later books. Over-the-top Amelia is able to master all manner of skills including medicine, archaeology, negotiation, languages and virtually anything else she turns her mind to. I’m sure she’d be annoying to be around at times but her total disregard for the social conventions of the day would, I think, make up for her superiority complex. The rest of the characters are either equally wonderful human beings (Amelia wouldn’t settle for anything less in her friends) unless they’re dastardly rascals intent on mischief. If you fancy a girls own adventure with a heroine you can’t help but admire and a liberal dose of humour then try Crocodile on the Sandbank for yourself. The plot is a little convoluted at times but it all works out in the end and, anyway, I like these books more for their sense of time and place and can forgive some annoyances with the plot. This entry was posted in book review, Egypt, Elizabeth Peters. Bookmark the permalink. Amelia Peabody induces a bit of teeth grinding in me, but you are right, there is still something quite attractive in the setting and stories. Poor old Radcliffe never stood a chance. I absolutely love this series! I’m about halfway through now. I have been listening to them on audio and I find them to be fun, light reading.